Make your stock Fox Mustang seats look and fell like expensive aftermarket Sport Seat without the high cost and mismatched styling. TMI Sport Seat option gives your factory sport seats a modern look with contoured edge seat pads to hold you snug in place. 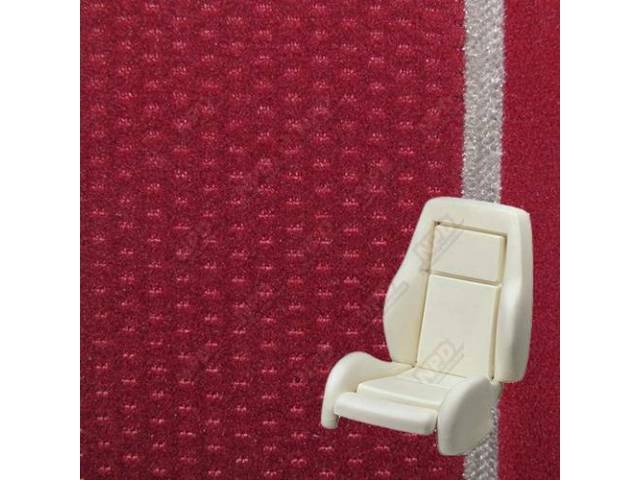 TMIs molded Sport Seat foam and upholstery are available in many different styles and materials and are patterned to look like original units. Made is America from the best automotive grade materials and state-of-the-art processes these seats are sure to give you the look and support you are looking for. THESE SPORT SEAT SETS ARE MADE TO ORDER PLEASE ALLOW 4 TO 8 WEEKS FOR DELIVERY. Please note that all sport seat conversion upholstery sets included the correct designed sport seat foam for the front buckets for proper installation. The use of your original rear seat foam is required. Quick Tip:Please note that if your Fox Mustang did not come originally equipped with sport or GT style seat then sport seat foam will not fit your standard seats. Replacement will require you to locate a donor set of front Sport or GT seats to complete the conversion. Please check the year and make of your donor seats before ordering.